WeatherTech Cargo Liners provide custom trunk & cargo area protection. All cargo liners feature a raised lip to keep spills, dirt and grease off your vehicle's interior. Cons: The only drawback of these Liners is they are not available in a few more colors, especially red, to match other Corvette interiors. We Corvetters use our cars in a variety of ways. Some of us race them. Others like to show them. Some Corvettes are drivers. Others sit in garages gathering dust. My '95? Well, it's kind of a driver, sometimes, but the most miles it sees are on long trips. It's been coast-to-coast once. It's been on the Black Hills Classic,. Twice, it's been on the VetteNet Southwest Tour. It was the Lead Car for the Southern California/Southern Nevada Section of the 2003 National Corvette Caravan and we used it to prerun the route of the 2014 Caravan. It's been in innumerable day trips with my Corvette Club. Basically, I drive it long distance. Often, on these trips I take, I'm hauling something: a couple of overnight bags, my metal camera case, a plastic crate full of my "road service" kit (tools, service manual and a scan tester), my laptop computer case and other stuff I'll take on my adventures. Then, there's the unusual day-to-day stuff, like the time I put my cat in the kitty carrier and took her to the vet in the Vette. Or the time I'd loaned my daily driver to my Wife because her car was in the shop. Then, I had a flat tire in my "back-up" daily-driver, an S10 Blazer. I had to take the tire out for repair in the back of the Vette. Probably the most important job I've ever done with my '95 Vette was hauling eight cases of beer to a NASCAR "party". All this kind of stuff goes in the back of my '95 Coupe. but I never worry about messing-up the carpet. Think I'm nuts? Well...perhaps, but one of the first accessories I ever purchased for that '95--the day I bought the car, in fact--was a WeatherTech Cargo Liner. It's specially sized and contoured for the back of a C4 Coupe. I have a black one which matches my car's black interior. I've had it in the car for almost 20 years and it's kept the carpet in the back of my car in good shape. After all those years, because of the Cargo Liner really not that much worse for wear. We also have a Cargo Liner in our '04 which we installed soon after we bought it 11 years ago. That one. also. has seen a lot of trips, including being the Lead Car for the Caravan in 2009. For our newest addition, a 2012 Z06, what was one of the first accessories we acquired? A WeatherTech Cargo Liner for '05-'13 Vettes and we used it immediately as we picked up the car in Pennsylvania, dropped a lot of baggage in the back, then drove it, 3500 miles home to California via Virginia and the Corvette Museum in Kentucky. 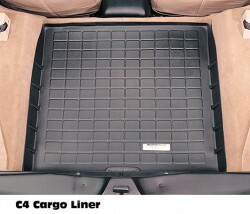 WeatherTech Cargo Liners have a raised lip that contains spills and protects your cargo area carpet from wear and tear. These custom-molded liners won't curl, crack, or harden, even in sub-zero weather. Cleanup is quick and easy. Just wipe up with a damp cloth, sponge or vacuum. If the Cargo Liner is really soiled, remove it, wash with soap and water then let it air dry. WeatherTech Cargo Liners have a three-year warranty. They are incredibly durable, too. Not only has the the one in my '95 been in service for 20 years, I have one in a Chevy S10 Blazer which has been there for 13 years and another in an '04 Vette which has been there 11.